Want one of these? Of course you do! Everyone loves stickers! Big shout out to one of our Event Sponsors this year, StickerGiant.com – the leader in Digital Custom Sticker and Label Printing online and in Colorado – for providing a sticker for every participant in this year’s race! Think how cool this sticker will look – on your car, on your locker, in your house, on your forehead – well, anywhere you like. Tell the world you are a Happy Smackah with a sticker – register today! 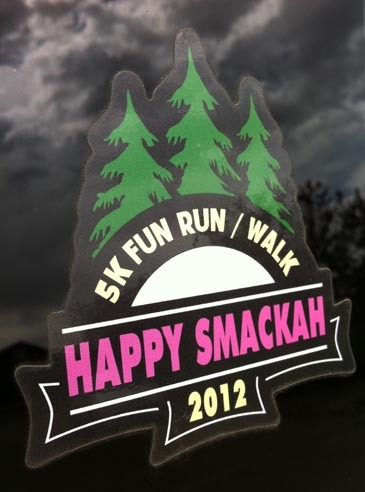 If you haven’t signed up yet for the 2012 Happy Smackah 5k Fun Run, we know you will now! See you there on May 12th! I think they are so cool! I’m going to make mine into a magnet or a Christmas tree ornament. :). Thx StickerGiant! Love the stickers! Sticker Giant–you rock!! Thank you so much! Sticker Giant is the best! They made us one that’s a magnet. They are so cool!